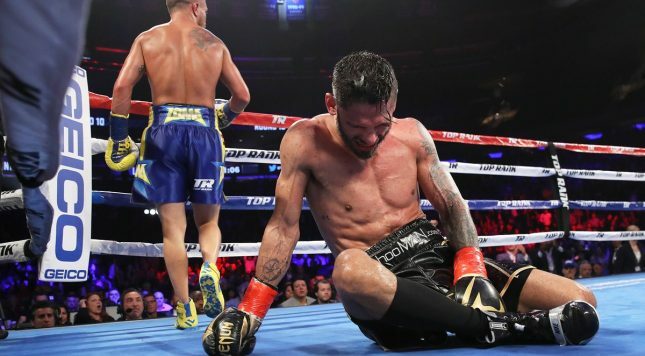 For a while early, and then right in the middle, it looked like Vasyl Lomachenko’s otherworldly skill might not be enough to guarantee a victory against the bigger, faster and himself-pretty-skilled Jorge Linares. But Saturday on ESPN, Lomachenko overcame a rare knockdown to himself score a knockout in the 10th round. This might be Lomachenko’s most impressive victory. Guillermo Rigondeaux might have been his best opponent, but Rigo was moving up in weight, while this time it was Loma who was moving up to lightweight. It’s nearly impossible to argue against Lomachenko as the best fighter in the game right now. To hear the ESPN team call it — the house fighter was Loma, fighting for Top Rank on “Top Rank on ESPN” — Linares wasn’t even in the ring (this writer had him in a year-end pound-for-pound top 10). But the first couple rounds, with little to distinguish between either man, might have justifiably been scored for Linares. Loma started to get into a rhythm, and it looked like he could be gearing up to run away with it. Everyone got a wakeup call in the 6th, when Linares scored a counter right-hand knockdown. Loma wasn’t badly hurt, but he was hurt legitimately, and spent the rest of the round and part of the next recovering and dialing down the aggression, apparently growing more cautious. The intervening rounds before the final one were relatively close. Loma scored a sneaky, perfect left hand to the body in that 10th and final round. Linares looked like he might make it up. Alas, once he was to his feet, he was in no condition to continue. The judges had it a draw coming into the ultimate round, a bit too close but a demonstration that the fight was closer than the near wipeout ESPN was calling. It wasn’t exactly a stereotypical action-packed Fight of the Year, yet Lomachenko vs Linares was well-fought, dramatic and had a big finish. In a diluted era of “title belts,” Loma’s achievement of getting three divisional titles faster than anyone isn’t the thing to focus on. It’s that he has beaten more quality opponents quicker than anyone else ever has. Seriously, the guy has 12 fights as a pro, after Saturday. The 12th showed us he’s more than simply hyper-skilled: He’s got heart, too. In showing a smidge of vulnerability, he proved he’s more amazing than we knew.